Credit: Illustration: CXC/M.Weiss; Spectrum: NASA/CXC/N.Butler et al. A 21-hour Chandra observation of the afterglow of the gamma-ray burst GRB 020813 revealed an overabundance of elements characteristically ejected by the supernova explosion of a massive star. The afterglow is thought to be produced by the interaction of a jet of high-energy particles with the expanding supernova shell (see illustration). Narrow lines, or bumps due to silicon and sulfur ions were clearly identified in the X-ray spectrum of GRB 020813 (so named because it was discovered by the High-Energy Transient Explorer satellite on August 13, 2002). The High-Energy Grating Spectrometer aboard Chandra allowed a team of astronomers to study details of the X-ray lines. Two gratings dispersed X-rays from the source much like a prism disperses visible light to produce the crossed bands shown in the image below the illustration - the narrow bright regions are the spectral lines. An analysis of the Chandra data showed that the ions were moving away from the site of the gamma-ray burst at a tenth the speed of light, probably as part of a shell of matter ejected in the supernova explosion. The line features were observed to be sharply peaked, indicating that they were coming from a narrow region of the expanding shell. This implies that only a small fraction of the shell was illuminated by the gamma-ray burst, as would be expected if the burst was beamed into a narrow cone. The observed duration of the afterglow suggests a delay of about 60 days between the supernova and the gamma ray burst. 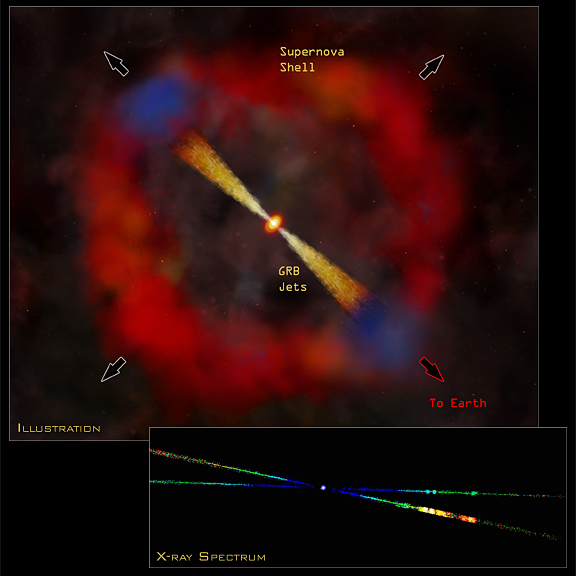 The data appear to support the supra-nova model for a gamma-ray burst, in which the burst occurs soon after, but not simultaneously with the supernova. The collapse of the core of an extremely massive star precipitates an explosion that ejects the outer layers of the star at high speeds, while the collapsed core forms a black hole surrounding by a swirling disk of matter. A short time later, this black hole-disk system produces a jet of high-energy particles. Shock waves within this jet are thought to produce a bright burst of X-rays and gamma rays observed to last only a few minutes. Interaction of the jet with the shell produces the X-ray afterglow, which can last for days or even months. The reason for the delay between the formation of the black hole and the production of the jet is not understood. Credit Illustration: CXC/M.Weiss; Spectrum: NASA/CXC/N.Butler et al. Coordinates (J2000) RA 19h 46m 41.90s | Dec -19° 36´ 05.10"